You might ask the Brothers Gloom: what is the party you were born to throw? The party you have been waiting with every fiber of your being to throw. Well, we are ready to answer that question. Belle & Sebastian, while they are one of our favorite bands of all time, are not exactly a dance juggernaut, but lo, suddenly they’ve re-embraced synthesizers, they love dancing, they even have an album with dancing in the title! 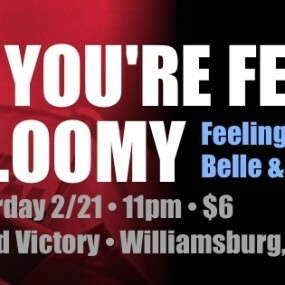 So we decided it was a great time for us to cobble together the few dance songs B&S have already, smush them up with the great songs from their newest LP, and throw in a giant heap of our favorite indiepop to boot, and then we will throw the BEST (er, well only) BELLE & SEBASTIAN-THEMED DANCE PARTY EVER! Were you (are you?) on the Sinister list? Did you have a cassette copy of Tigermilk? Do you remember bugging the DJ at your favorite britpop dance party to play Electronic Renaissance? Between the two of us, we’ve done all these things and far, far geekier heights of B&S fandom. Whether or not you’re a superfan or you just enjoy the odd Scottish pop song, this is the night where we’ll bust out our anoraks and Sarah Records and celebrate one of the best bands on the planet.